Two Views of Kidney MRI scans. A doctor or physician may order an MRI scan of the urinary tract to take pictures of the kidney and nearby organs. An MRI is useful because it shows healthcare providers what tissue is normal, and what tissue is not. Many organs in your body can be seen during a quality MRI of the urinary tract. The urinary tract includes two kidneys, two ureters, a bladder, and a urethra. This MRI will be focused on the two kidneys, which filters blood and maintains fluid levels in the body. A kidney MRI scan may be done to check for certain cancers or other illness. The MRI may show tissue that has cancer cells and tissue that does not have cancer cells. A kidney MRI can be used to guide doctors or surgeons during a procedure, such as a biopsy. An MRI scan may be used if surgery is needed to remove a growth or lump. A MRI scan of the kidneys can show healthcare providers how well a treatment for a disease is working and the results of a quality MRI scan can help in the plan for the best treatment forward. 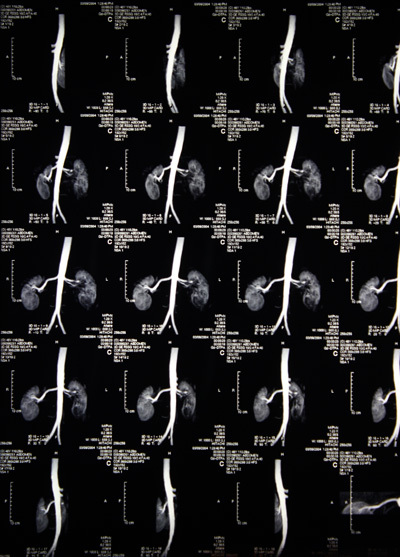 A MRI of the kidneys can help healthcare providers detect kidney disease. Kidney tumors can also be found and the size of the tumor can also be determined. An MRI scan may show if one or more stones have grown in your kidney or gallbladder. A MRI of the kidneys can help find the cause of kidney failure also. ABOVE: MRI of kidneys and aorta.